NORWALK, CT – June 10, 2015 –Irving Levin Associates, Inc. will host an important health care webinar on Thursday, June 18, 2015, during which expert panelists will discuss how to determine the difference between business value and real estate value for various types of healthcare properties. When healthcare acquisitions have a real estate component (LTC, hospitals, rehab, LTACs, behavioral, urgent care clinics, etc. ), separating the value of the real estate from the business is always controversial. In fact, bank regulators have pressed for a clear line, with different lending practices for the real estate and business components. Join our expert panel as we discuss business value vs. healthcare real estate value. Stephen Monroe, Editor of The SeniorCare Investor and moderator of the panel, will pose topical questions such as: Is the real estate worth 75% of the total value, or is it closer to 90%? Does the relationship vary by real estate type? How does this impact your investing decisions? And how does it impact your lending decisions? Our panel of experts will address these topics and others—and answer any pressing questions the audience wishes to submit. Our experts include: Colleen Blumenthal, Managing Partner, HealthTrust LLC; Zach Bowyer, Managing Director, CBRE, Inc.; Aaron Murski, Managing Partner, VMG Health; and Michael Vaughn, Senior Vice President, Walker & Dunlop LLC . 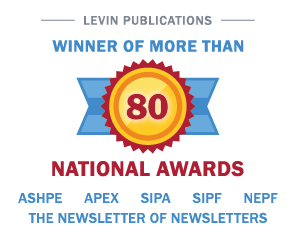 Founded in 1948, Irving Levin Associates, Inc. is the leading publisher of newsletters, reports, and online data on mergers and acquisitions in the seniors housing and healthcare industries. Irving Levin Associates invites you to take part in this don’t-miss webinar. Healthcare Real Estate: Business Value vs. Real Estate Value is expected to generate a stimulating discussion. If you’re interested in this topic, you’ll want to attend this informative webinar on Thursday, June 18, at 1:00 pm ET. Please visit www.levinassociates.com/conferences/1506b-online-conference or call (203)846-6800 for more information.